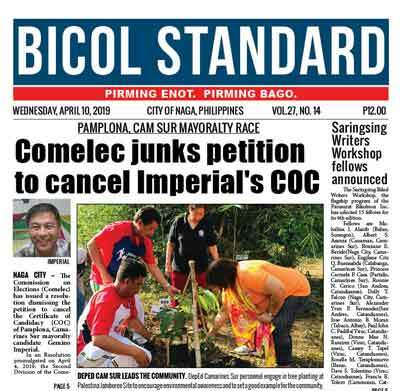 NAGA CITY(Bicol Standard) -- The Commission on Elections (Comelec) has issued a resolution dismissing the petition to cancel the Certificate of Candidacy (COC) of Pamplona, Camarines Sur mayoralty candidate Gemino Imperial. In an Resolution promulgated on April 4, 2019, the Second Division of the Comelec presided by Luie Tito F. Guia, with Senior Member Socorro B. Inting and Junior Member Antonio T. Kho, Jr. said: "WHEREFORE, premises considered, the Petition to Deny Due Course and/or Cancel the Certificate of Candidacy of Gemino A. Imperial is hereby DENIED." Petitioner, Augustus Caesar M. Cruz III, incumbent mayor of Pamplona, Camarines Sur alleged that Respondent Imperial should be barred from running for any elective office absent any restraining order or injunction from a competent court in relation to the Ombudsman's Decision in OMB-L-A-16-0551. He further alleged that the accessory penalty of perpetual disqualification from holding public office, which both applied to elective and appointive position, even when there is a pending appeal, shall not stop the decision from being executory. 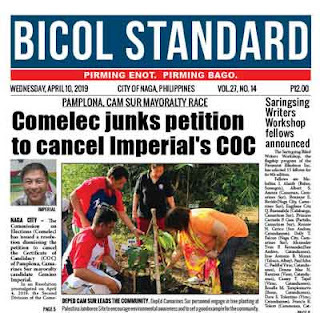 On the other hand, Imperial argued that the petition for cancellation of his COC should be summarily dimissed as the same fails to invoke the exclusive ground of false material representation allegedly made in his COC. The Comelec in resolving whether or not Imperial's COC should be denied due course and/or cancelled based on the decision rendered by the Ombudsman in OMB-I-A-16-0551 which meted him the accessory penalty of perpetual disqualification from holding public office ruled in the negative. It maintained: "Jurisprudence has clearly established the doctrine that the petition for disqualification and a petition to deny due course or cancel COC are two distinct remedies to prevent a candidate from entering an electoral race." "For a petition to deny due course or cancel the COC of one candidate to prosper, there must be an evident material misrepresentation involving his qualification in connection to the position to which he seeks to be elected, including, among others, his residency, age, citizenship, and legal requisites as provided under the Local Government Code." The Comelec further said that Petitioner filed the wrong petition as well as failed to buttress his position that Respondent's COC should be denied due course or cancelled by reason of the Ombudsman's Decision, which is immediately executory but not yet final. Said Decision, the Comelec reiterated, has not attained finality by reason of the appeal filed by Imperial through a Petition for Review before the Court of Appeals. Hence, Imperial is still allowed to run for public office. Comelec added that all told, Imperial did not commit any false material representation when he stated under oath that he is eligible for the office to which he seeks to be elected.